I love running. I love those early mornings on the wet grass; those late nights through city streetlighting, when the cats watch from fenceposts; I love track sessions when you count down the repetitions, feeling yourself drawn ever thinner on each one. But sometimes I don't enjoy it much at all. Every runner has been there: the training session you face joylessly, but need to complete because it's on your schedule. The session you feel you need to do because you ate too much yesterday (and the day before). And not running is often not much fun. And then there are occasions like last week, when ten days before a marathon I find myself in Paris, with Thing 2 (aged 12), showing him the delights of that city. Because I only had five weeks between two marathons, and because I am not a professional athlete, and have too much else to do in a professional capacity, I decided that I would have a brief, deep taper (a taper is the period in which you cut down on your running in preparation for a race -- it gives an opportunity for muscle tissue to repair, and for your mind and body to build strength in preparation). This means that I trained very hard on Tuesday, then took the train to Paris on Wednesday. And I did not pack my running shoes. So my taper is going to be short and deep -- ten days of total rest. 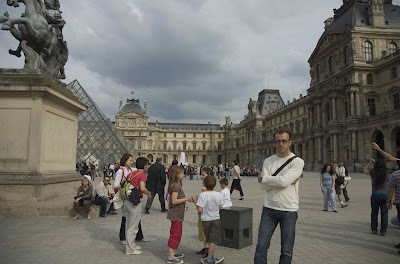 The problem was that I was in Paris. And no matter how much I restrained myself, L'Avant-Gout, one of my very favourite restaurants, is just irresistible. It was a conflict I could not win. And many other places and foodstuffs in Paris are irresistible. I ate macaroons, pain au chocolat, pot au feu, fois gras, pate de fois gras, snails, steak, moulleux chocolat and more. And I have returned looking, and feeling like foie gras. And this is the burden I have to bear for 26.2 miles around Edinburgh this coming Sunday. And this is why, sometimes, I do not like the self-denying rigours of being a runner. self-denial is overrated. a little indulgence is good for the soul, especially when one finds oneself in a gastronomic wonderland.